Assam Chief Minister Sarbananda Sonowal chairing the 1st meeting of the Assam State Capital Region Authority in his office conference hall at Janata Bhawan . Assam Chief Minister Sarbananda Sonowal on Tuesday said that rights of the tribal people falling within the jurisdiction of Assam State Capital Region Authority (ASCRA) would be fully protected. The Assam CM also directed the Guwahati Development Department (GDD) to take necessary steps to address the apprehensions raised by the leadership of Autonomous Councils regarding preservation of distinct identity of the tribal people and maintaining their rights over land. 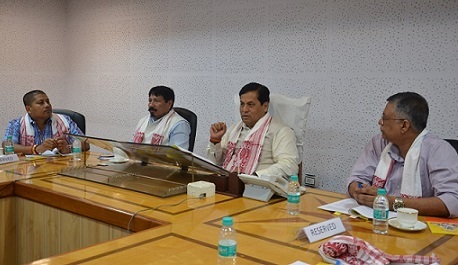 Chief Minister Sonowal while chairing the first meeting of the ASCRA at his office conference hall at Janata Bhawan said that the Capital Region Authority was created with a vision to make Guwahati as the hub of South East Asian countries. He said that the Government wanted to unleash faster development in the areas falling with the Authority by making the people important stakeholders of the development process. Keeping in view the apprehensions raised by the Chief Executive Member (CEM) of Rabha Hasong Autonomous Council and Tiwa Autonomous Council, Sonowal agreed on the need for more clarity on certain provisions of the ASCRA Act concerning land rights of the tribal people. He asked the GDD to effect suitable amendments to address their concerns. Sonowal also suggested the Council leadership to put forth the kind of modifications required in consultation with local organizations and people so that same can be suitably incorporated in the Act. Moreover, the Chief Minister directed the GDD to carry out a study to collect relevant data regarding land ownership, economic activity, etc. for taking a holistic approach for preparing plan for the areas within the Capital Region Authority as first step towards making the Authority operational. Sonowal further emphasised giving the people living within the region equal opportunity for voicing their concerns and views on the ASCRA and directed the department to convene public meetings in each of the districts falling within the Authority. Earlier, Secretary, GDD, SS Meenakshi Sundaram while giving a broad overview of the ASCRA informed that 24 revenue circles of five districts, namely Kamrup (Metro), Kamrup, Nalbari, Darrang and Morigaon comprised the Authority with an area of 6137 sq km. GDD Minister Siddhartha Bhattacharya, Minister for Town & Country Planning Atul Bora, Minister of State (independent charge) for Urban Development Pijush Hazarika, West Guwahati MLA Ramendra Narayan Kalita, Nalbari MLA Ashok Sarma, Sipajhar MLA Binanda Saikia, Palasbari MLA Pranab Kalita, CEM of Rabha Hasong Autonomous Council Tankeswar Rabha, CEM of Tiwa Autonomous Council Paban Manta, Principal Secretary to Chief Minister Sanjay Lohiya, Director of Institute of Architecture, Nirma University, Ahmedabad Prof Utpal Sharma and other senior officials of the GDD were present in the meeting.